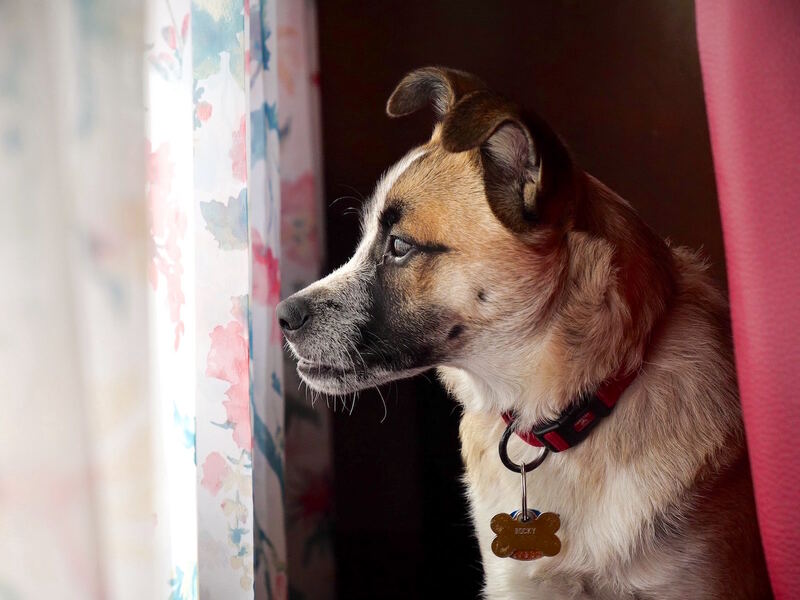 Yesterday we received a call from a trainer friend who was out working with my recently adopted dog, Darwin. 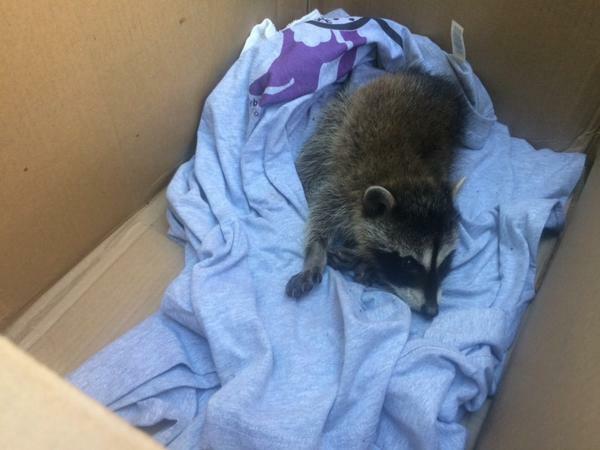 Kathy said that the dogs had identified an injured baby raccoon on the UC Berkeley campus. Because she was out with four dogs, she needed help rescuing him. The dogs were very good and didn't try to harm the poor kit. It's spring and this means that it's time for baby birds and mammals. 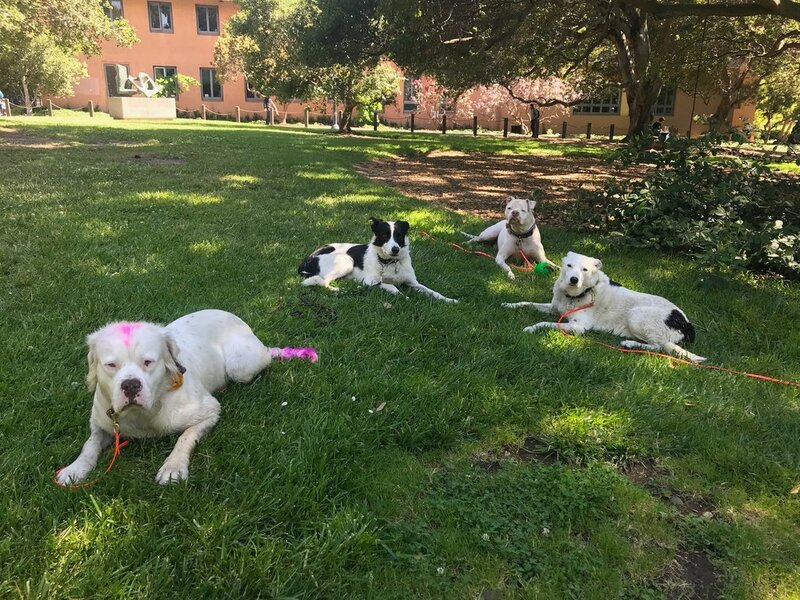 Darwin is the black and white dog in the middle and he is joined by Bernadette with the pink accents, his brother from another litter, Charlie, and Patrick, the white boxer. Zhandra and I put a couple of t-shirts into a large box and drove up to the Berkeley campus, stopping on the way at the hardware store to pick up some welding gloves. We parked near the Faculty Club, crossed the bridge, and went down onto the banks of Strawberry Creek, where the little raccoon was stuck. Its legs were tangled in the ivy and it made little grunting sounds to indicate that it was actually ferocious and bit at the cloth that we used to gather it up. We disentangled it and placed it in the box. The kit was unable to walk and seemed dehydrated. We called a wildlife hotline and their advice was to keep it in a cardboard box with a lid, or a closed paper bag in a warm, dark, and quiet place until we could bring it to the hospital. Then we faced the dilemma of who would examine it at 5 pm on a Monday. After making several calls, we were relieved to find that the Lindsay Wildlife Hospital in Walnut Creek was open until 7 pm. Raccoons are nocturnal and den in tree cavities, underground burrows made by other animals, as well as human-made structures. 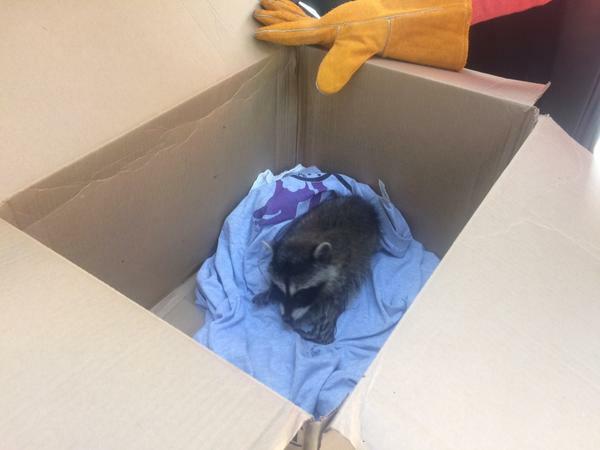 In general, the wildlife hospital recommends that when you find young raccoons out in the open, you wait until evening to see if the mother returns. It was hard to know what to do in this case but as the kit seemed distressed and had been entangled, we took it in. 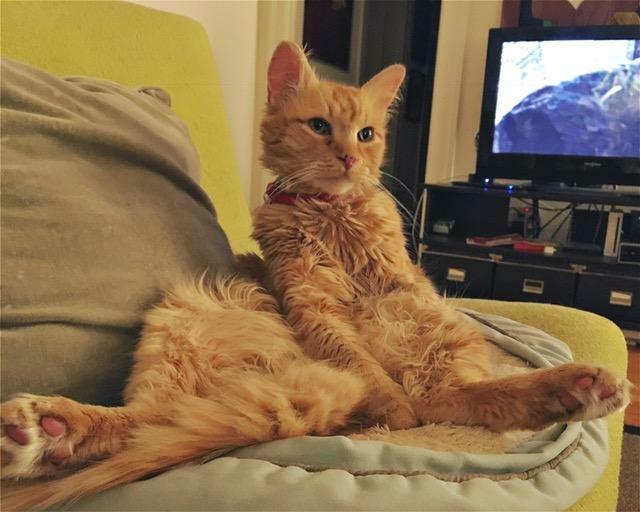 They accepted the kit and told us to call in four days to see how it is doing. Then it may be that we will need to take it back to campus and see if we can find its mother in the nights to come.